Still in the Western Corridor of the Serengeti and after a relatively unsuccessful previous day waiting for our “flat cats” to raise themselves and start moving and playing, we were up and on our way by 6h30 the next morning full of expectation that a fresh start would reveal something quite unexpected. 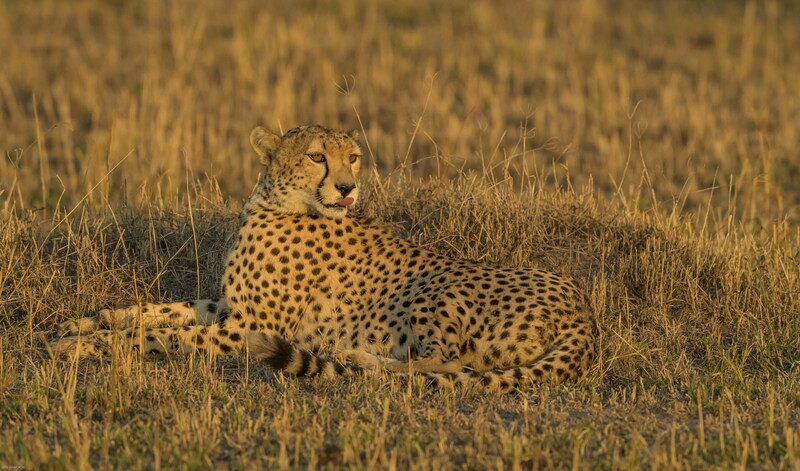 Our guide, Yona, told us that a cheetah female and her two cubs had been seen near Masira hill late the previous evening. We found the female and her two year old cubs lying in the open plain below Masira hill. It was cool early in the morning so they were in the open and had not yet sought shade. 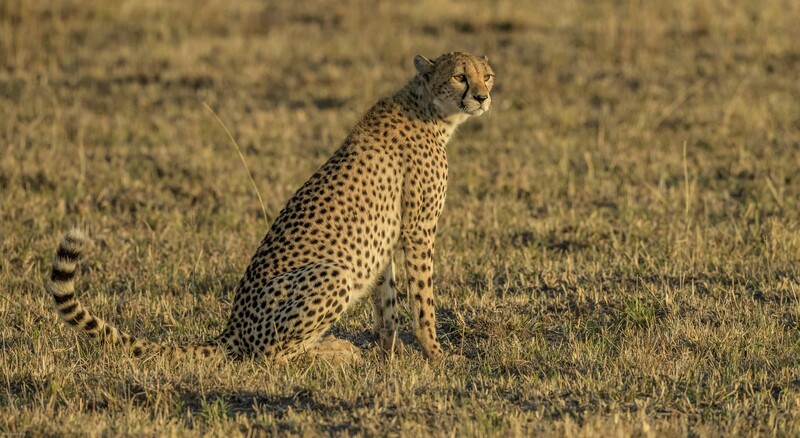 When cheetahs lie down their thin frame makes them difficult to see. Normally the only time you will see them from a distance is when either their head pops up to have a look around or you see a flick of the tail. This morning the cheetahs were on the lookout for something to hunt but there was no prey anywhere near. 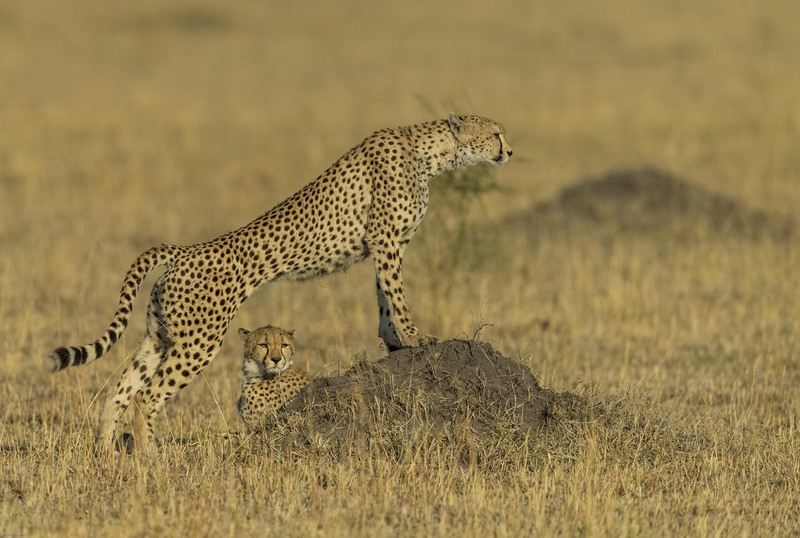 A family group of warthogs could be seen in the trees below Masira hill which were about three hundred metres away but they drew only a brief glance from the cheetahs. One of the key advantages of getting up early is that you get the low angle light which is warm in colour. 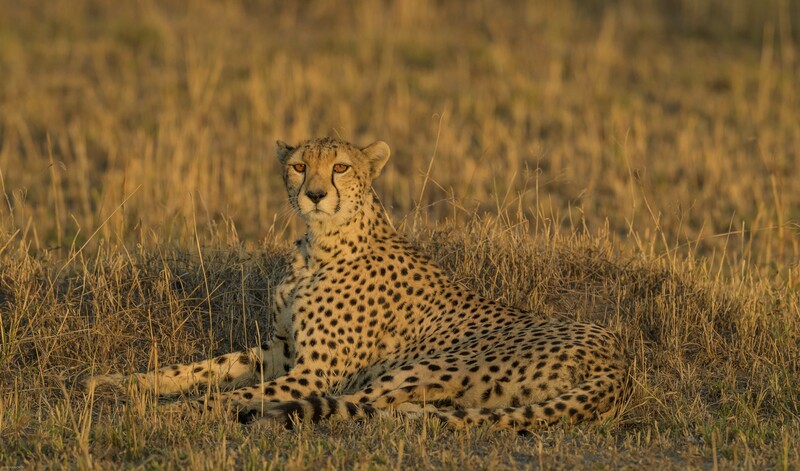 This is the best time to get natural illumination in the cheetah’s eyes. 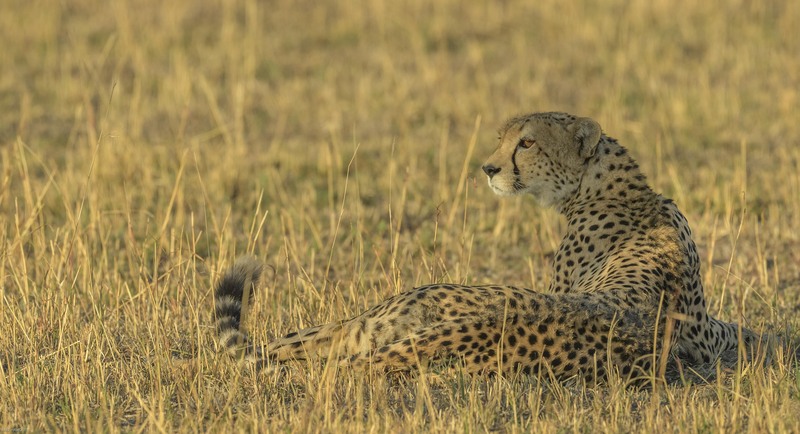 An important advantage of being in this part of the Serengeti in September was that the grass had been well and truly eaten down and it was relatively easy to see and photograph the cheetahs without grass in front of their faces. The female and one of her cubs were lying next to each other. The youngster seemed to be much closer to its mother while the other one lay some distance off, and did not seem to seek the physical closeness of its mother. The mutual preening is a bonding process and also provides a quick clean after the meal the day before. Up on the Masira hill we had seen giraffe browsing on the tops of the trees. As time passed, we noticed that all the giraffe were walking down the hill towards the cheetahs. 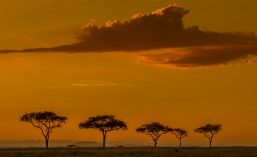 At first, we thought it was just coincidence, but it soon became apparent that they were gathering because of the cheetahs. 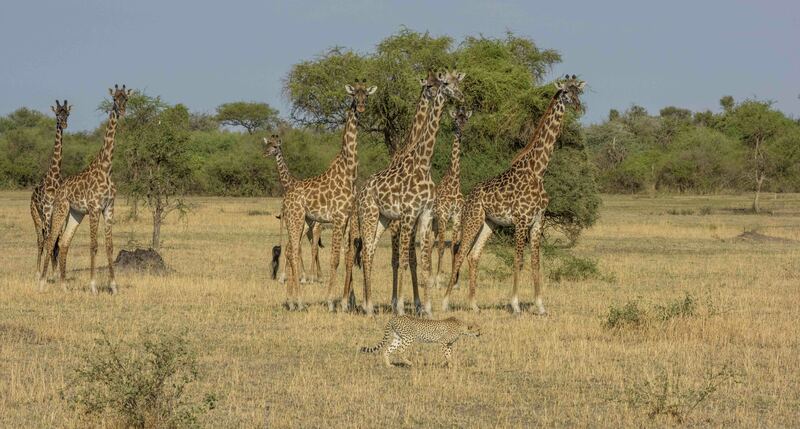 Eventually about fifteen giraffe came down from the Masira hill and started to gather in front of the cheetahs. The mother cheetah had already moved to large area of shade under a bigger tree to the right of us. The cubs stayed put under small bushes in front of the giraffe gathering. The standoff became intriguing. I had never before seen giraffe gather to intimidate cheetahs. In a previous post from Mashatu, I described how guineafowl had mobbed three young cheetahs driving them out of the area. The giraffe seemed to be doing a similar thing. Until now I had never realised that cheetah had such a tough time. I knew that lion, hyaena and leopard regularly stole their kills but I never realised how many savanna species actively drove off cheetahs. 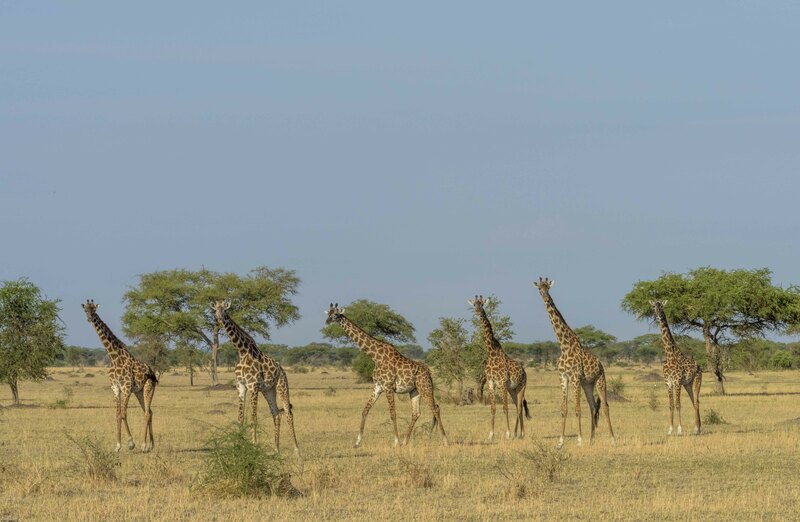 The more the giraffe congregated the more intimidating they became not only because of their numbers but also their size. I am sure every cheetah knows only too well the power and danger of a giraffe kick. Eventually the young cheetahs were sufficiently intimidated and got up and walked, as confidently as they could, back to their mother. The young cheetah did not run but walked nonchalantly trying to show they were not impressed by the show of force. I never heard a sound from the giraffe but they certainly communicated to produce the gathering. It makes me think that giraffe communicate through infra sound, a low frequency sound which we cannot hear. I know the collective noun for giraffe is a tower of giraffe but after seeing this display I think a gathering is more apt. Once the giraffe had made their point they dispersed and moved back to Masira hill to browse on the treetops and bushes. We waited for quite a while that morning for the cheetah to start hunting but our patience never paid off. We returned later that afternoon and the cheetahs had moved only a short distance to get more shade. Patience in the afternoon was rewarded by the changing light. In the late afternoon, the sun lowers and the angle of the light continuously improves. This is the time when the cheetah’s eyes are best illuminated and you get to see the liquid amber colour of their eyes. 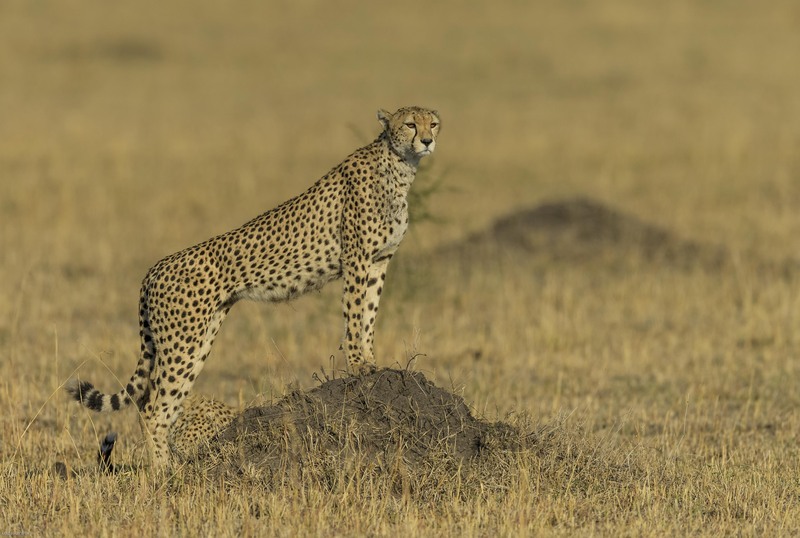 An iconic pose by an adult cheetah standing on an ant hill to get a better view of potential prey and threats in the distance. Seeing is much more than having the subject move right in front of you. It is a sense, a revelation that comes from quietly looking for the subtle changes in the light or the animal’s behaviour. Just because nothing has happened for the past 30 minutes is no guide as to what will happen over the next half an hour. A francolin could wander by and startle the cheetahs; the apparently sleeping cheetah could suddenly pick up a scent on the wind which has changed direction, which catches its attention. The late afternoon light casts a warm glow on the scene. One of the fascinating aspects about being out in the bush is that you never know what you are likely to find and invariably new interactions between species are revealed. The ability to move or even rest unseen in the bush is not easy as there are so many eyes watching each predator and those eyes are very happy to alert every living thing around to the whereabouts of that predator. Cheetah choose to hunt mainly in the day while other key predators such as lions and hyaenas are sleeping, so there is less competition. 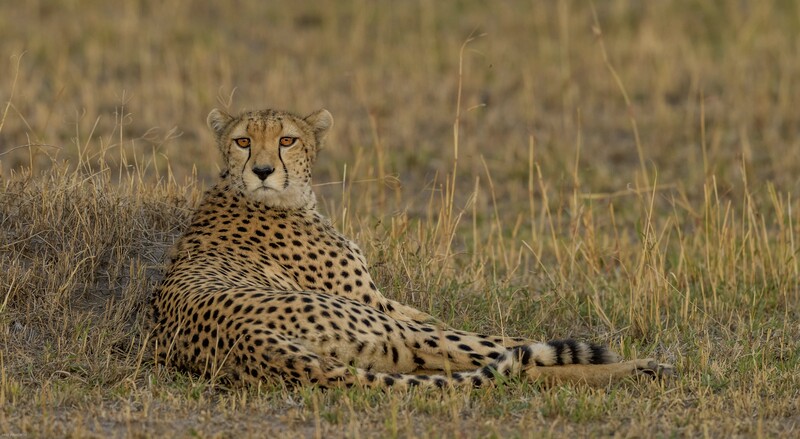 They also need to see what they are doing when travelling at 120 kilometres per hour while in full chase of prey. 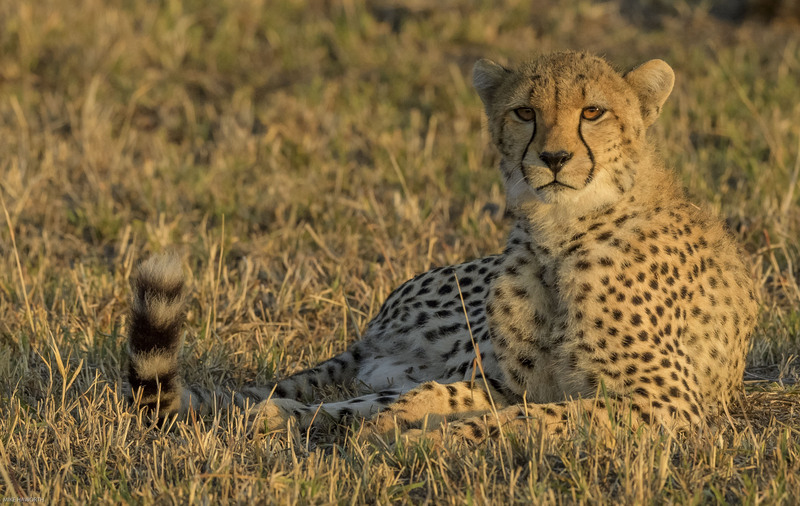 The down side of daylight hunting is that cheetahs are visible to baboons, vervet monkeys, birds, squirrels and giraffe during the day so seldom get peace and solitude. Hunting in the Serengeti is not as easy as would be assumed. 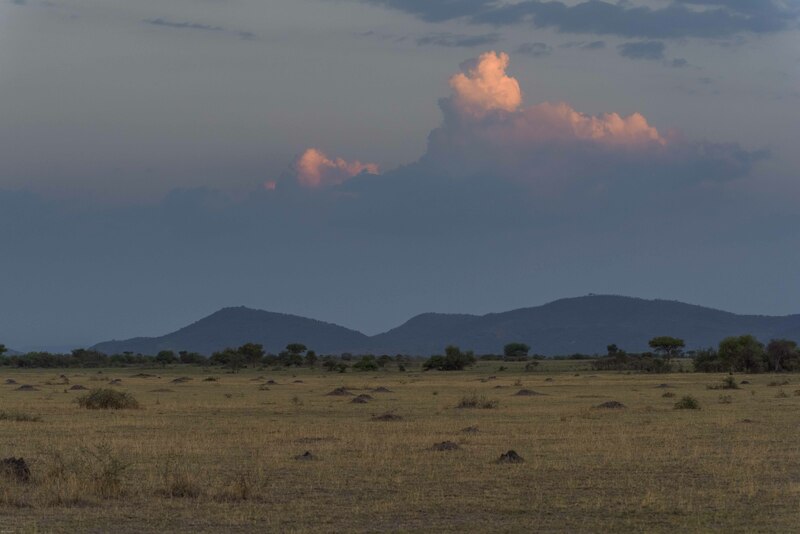 One of the key risks is that hyaena spread out all over the plains and the scouts lie unseen in tufts of grass. As soon as anything unusual happens or a cheetah makes a kill, invariably (out of apparently nowhere) a hyaena appears on the scene. Only when the hyaena is outnumbered will it start “whooping” for reinforcements. 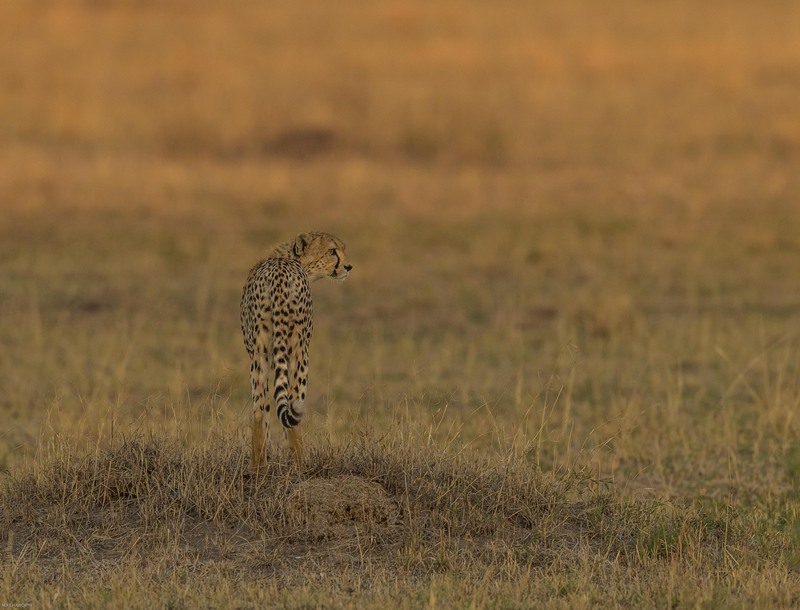 We left the cheetah family late that afternoon as the sun was setting and that was the last time we saw them. 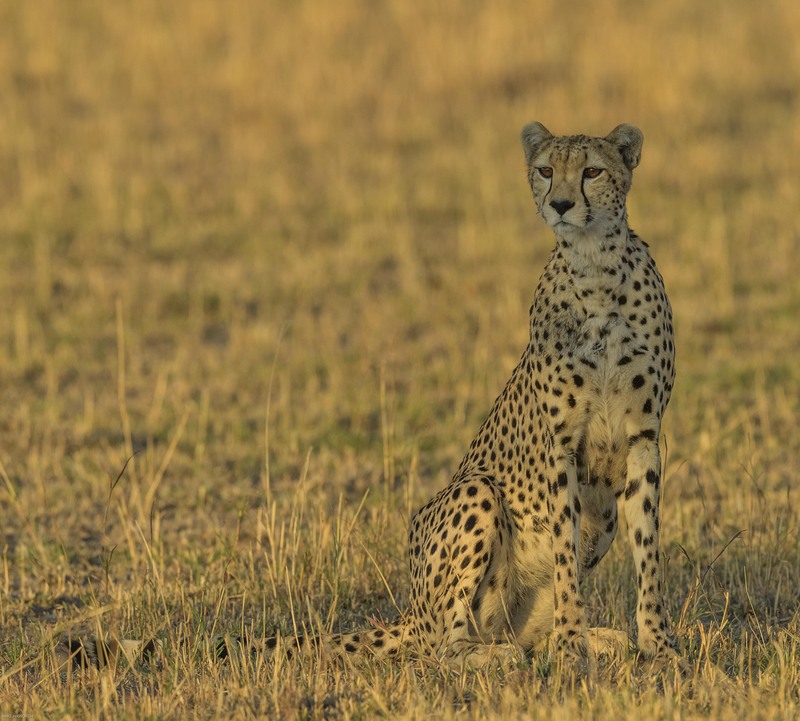 The plains are large and the predators move around looking for prey and to minimise competition from other predators. As we were one of two other vehicles out at that time there were few eyes to keep track of our wandering cheetahs. Once they lie flat, even the keenest eyes will not see then even in the short grass. When you spend time quietly in the bush you become aware that there is a lot going on. You also realise that your human senses have become blunted compared to the wildlife you are watching. The subtle changes in the wind can herald all sorts of new reactions. We humans, especially the “townies”, with our dulled senses are blissfully unaware of these subtle changes. I think wildlife operates at a much more subtle sensual level than most human beings. What is clear that the guides who spend much of their time in the bush do tune into these subtleties. A fascinating account and wonderful photographs! Wow! Amazing pictures. Giraffes are my favorite animal in the whole world! What an encounter. 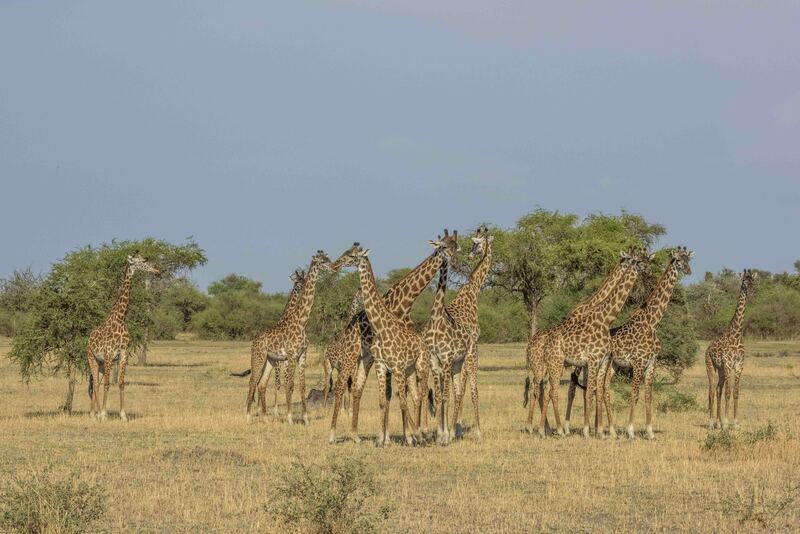 Gatherings of Giraffes are something special to see especially when they congregate to ward off Cheetahs. I am glad you enjoyed the post.